Marvel has released Iron Man 3's first official trailer. Let's break it down. First, let's watch the trailer. 1. Iron Man 3 Has a Vision - I enjoyed Iron Man 2 quite a lot, but I have to admit it didn't seem to have a purpose, other than putting Iron Man on the screen for a second time. It threw some cool stuff at us, but where was the story going? Nowhere, really. In the end, it seemed like it was just an excuse forRobert Downey, Jr., Gweneth Paltrow, and Don Cheadle to goof around. Iron Man 3 seems to have a vision - making Tony Stark as miserable as possible. 2. The Rocket-Powered Glove - See that glove that jumped off the desk onto Stark's hand? Okay, that was cool. Maybe we'll get to see his armor put itself on, similar to the experimental self-propelled armor in The Avengers. 3. Pepper Potts is in Trouble - So yeah, Pepper got in trouble in the first two movies. We saw her get chased by a giant robot, get almost cut in half in a car, and all sorts of other peril. But getting caught in a huge explosion with Tony? Having an Iron Man armor land on top of her...in bed? Wow. I'm really nervous for her in this movie. 4. The Fallout From Avengers - We hear Stark talking about "New York" and how he's had trouble coping. Clearly, he's referring to the alien invasion from The Avengers, and it's nice to see them continuing that story in Iron Man 3. Stark has always been cool and calm under pressure, but apparently launching a nuke into space, passing out, and falling to almost certain death has punctured his bravado. 5. 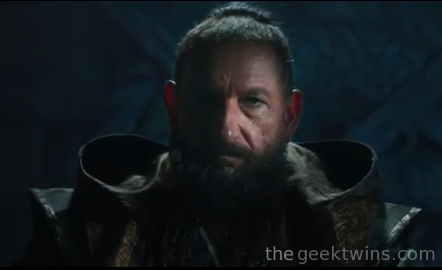 The Mandarin - At long last, we get to see Iron Man's archnemesis from the comics, the Mandarin. It's hard to say how good it's going to be, since we just barely get a glimpse of him, but the voice over is impressive. We truly get a sense of a powerful enemy with a messianic vision. And the ten rings! But are they just rings or the superpowered rings like the comics? 6. Iron Man Goes Chris Nolan - It's interesting to see the parallels between Iron Man 3 and Chris Nolan's Dark Knight trilogy, just from the trailer. We see the destruction of Tony Stark's home (just like the destruction of Bruce Wayne's home in Batman Begins), the destruction of Stark's other Iron Man armor (like the destruction of the Tumbler in The Dark Knight), and a villain who seems to have sweeping power and vision dedicated to a very personal level of destruction for the hero (like Bane in Dark Knight Rises). It seems that Marvel is trying to reach for a higher level of comic book movie, which is good for everyone. 7. The Shadows on the Wall - We see the shadows of people burned into walls. Commonly seen in a neutron bomb explosion. Reading into it too much? Maybe. But it certainly doesn't look good. 8. 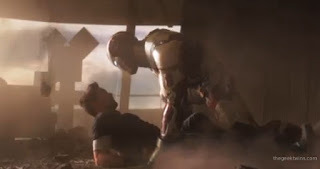 Iron Man Armor Has a Mind of Its Own - Numerous scenes show Iron Man's armor moving on its own, even fighting him. In the comics, Justin Hammer has taken over Iron Man's armor to control it remotely. We've also seen his armor take on artificial intelligence and wreak havoc on its own. Which is the case in Iron Man 3? I think it's likely to be the Mandarin controlling it remotely. 9. Stark Dragging His Armor - We also end with the scene of Tony Stark having to drag his armor along the ground. That's just...sad. His armor's power was always "at critical levels" in the previous movies, but it looks like in this one, it actually runs out. Now let's see how long we have to wait until...April 2013?! But I want it now! (sigh) We have a long road ahead of us, people. What did you think of the trailer? What did you notice? Are you more or less excited about the movie? Can the Mandarin be Saved for 'Iron Man 3'? It might be nice if they got in a little bit of a new direction. I mean the last one just seemed like it existed only to make money and set up "The Avengers" movie (to thus make even more money!) and really the story was kind of blase. Anyway, as much as I like Ben Kingsley, couldn't they have found someone Asian to play the part? I mean he is called "the Mandarin" right? I just hope they don't have him wearing buck teeth or anything like that. Even worse, April is the UK release date. We have to wait until May 3! i am a fan any road they should take... the problem is the bad guy looks like a reject from the "love guru"... go ahead look it's okay... i will wait... ... ... ... ... ... okay you are back, uncanny. my question to producers, who in their right mind want to attack iron man... don't want the wrath of the avengers on your backside. he just came off the whole new york thing. things i am catching the suit is not tony stark, it the other guy stealing the tech and the shadows on the wall are a scene from stark walking around the destruction of new york... as he reflects, but i may be reading more into it. god bless america, god bless iron man. Jeremy, you're right about the Love Guru look! As for the shadows, you're right. Could be an Avengers call back. I just saw the Avengers, and the Iron Man movies have been my favorites so far as far as superheroes go. I love Iron Man and this trailer blew me away. I feel like I have to wait for forever. Of course I say that about all my fave upcoming movies. Looks like Extremis is going to fit in nicely, though not a fan of them just going the 'mind-controlled' armour. I would have paid anything to see the armour come out of his bones like it is meant to.